The iPod nano 2nd Gen is almost identical to the previous generation model. It has a flash memory and an aluminum case thus being a hybrid between the iPod nano 1st gen and the iPod mini 2nd gen. As to hardware, the crucial improvement was boosting the battery life up to 24 hours. The display also became brighter or as Apple put it, more vibrant. As to software, Apple engineers improved the search engine. Video playback remained unavailable. The iPod nano 2nd gen is offered in three models of different capacities and colors. The 8 GB model is available only in black and the 2 GB model – in silver, while the 4 GB model is offered in silver, blue, green and pink. Later, 4 GB and 8 GB models were launched in red casings. Introduced on September 12, 200. Storage capacity: 2 GB, 4 GB, 8 GB. Dimensions: 3.5 x 1.6 x 0.26. Battery Type: Lithium ion battery provides 24 hours of playback. Colors: Silver, black, blue, green, pink, red. The controls on iPod nano are easy to find and use. Press any button to turn on iPod nano. The main menu appears. Use the Click Wheel and Center button to navigate through onscreen menus, play songs, change settings, and view information. Move your thumb lightly around the Click Wheel to select a menu item. To choose the item, press the Center button. To go back to the previous menu, press Menu on the Click Wheel. Here’s what else you can do with iPod nano controls. Turn on iPod nano: Press any button. Turn off iPod nano: Press and hold Play/Pause. Turn on the backlight: Press any button or use the Click Wheel. Disable the iPod nano controls (so nothing happens if you press them accidentally): Slide the Hold switch to HOLD (an orange bar appears). Reset iPod nano (if iPod nano isn’t responding): Slide the Hold switch to HOLD and back again. Then press the Menu and Center buttons at the same time for about 6 seconds, until the Apple logo appears. Choose a menu item: Scroll to the item and press the Center button. Go back to the previous menu: Press Menu: Go back to the main menu press and hold Menu. Browse for a song: From the main menu, choose Music. Play a song: Select the song and press the Center or Play/Pause button. Note that iPod nano has to be ejected from your computer to play songs. Pause a song: Press Play/Pause or unplug your headphones. Change the volume: From the Now Playing screen, use the Click Wheel. Play all the songs in a list: Select the list title (an album title or the title of a playlist, for example) and press Play/Pause. Play all songs in random order: From the main menu, choose Shuffle Songs. Skip to any point in a song: From the Now Playing screen, press the Center button to show the scrubber bar, and then scroll to any point in the song. Press the Center button to resume playing from that point. Skip to the next song or chapter in an audiobook or podcast: Press Next/Fast-forward. Start a song over: Press Previous/Rewind. Play the previous song or chapter in an audiobook or podcast: Press Previous/Rewind twice. Fast-forward or rewind a song: Press and hold Next/Fast-forward or Previous/Rewind. Add a song to the On-The-Go playlist: Select a song, and then press and hold the Center button until the song title flashes. Find the iPod nano serial number: From the main menu, choose Settings > About, or look at the back of iPod nano. If you have a large number of songs or other items, you can scroll quickly through a long list by moving your thumb quickly on the Click Wheel. Note: Not all languages are supported. Move your thumb quickly on the Click Wheel, to display a letter of the alphabet on the screen. Lift your thumb momentarily (or stop moving your thumb for about one second) to return to normal scrolling. Use the Click Wheel to finish navigating to the item you want. Apple Model No: A1199 (EMC 2115). The player has a scratch proof case, which is the blessing for to active or clumsy users. To use some features, advertised by Apple, a user has to buy some extra devices. Thus, to listen an FM radio a user has to buy an Apple Radio Remote ($ 49) and to make a voice record a user has to buy Belkin’s tiny TuneTalk Stereo ($69.99) which augmented the initial price of the device. Trade in your used iPod nano for fast cash at iGotOffer: We buy old Apple iDevices for cash. 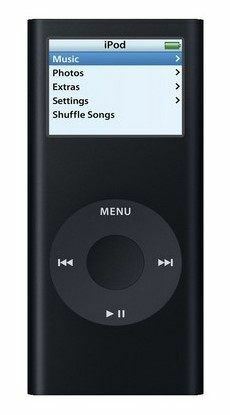 Instant quote, free shipping, fast payment: iPod nano for sale. iPod Nano 1 GB, 2 GB, 4 GB – The iPod nano, a portable player to fit a clock pocket on your jeans, starts the latest line-up of Apple’s iPods.